The Cross is a place of remembrance, the suffering of our Lord Jesus Christ, his death and resurrection. The cross represents agony, love and freedom. The physical heart is the most important organ in the body. It is a complex pump for the circulation of blood oxygen and nutrients. The bible mentions the human heart more than 300 times; but not has a pump but a spiritual part of us where our emotions and desires dwell. We are made in the image of God. God gave everyone of us a heart because he has one too. God knows the heart of man. After the fall in the garden, the heart was defiled, it became very wicked. “For it is from within, out of a person’s heart, that evil thoughts come—sexual immorality, theft, murder, adultery, greed, malice, deceit, lewdness, envy, slander, arrogance and folly” (Matthew 15:19). And for this reason Jesus came to redeem us from the sin that entrap us. We are the redeemed of the Lord; we have confessed our sins and accepted the invitation to freedom; freedom from sin and death through faith in Jesus, our Lord and Saviour. BUT the struggles of the flesh a real; they remain as long as we are on this side of eternity. We must therefore make it a mission to constantly ask the Holy Spirit to cleanse our heart and renew our spirit. Salvation does not start and end at the point of conversion but rather its a start of a process – the working out of faith in obedience to God. Our hearts were changed at the point when we received Jesus; this happened through the power of God in response to a request, “Lord Jesus, come into my heart”. To develop a relationship with Jesus our hearts must remain open to receive from God. An open heart is subject to change, growth and transformation. A closed heart is unrepentant, hardened with pride and ego. A heart that is open can be washed, cleaned, emptied of negative things and made brand new. A close heart will harbour evil thoughts and these eventually lead to bitterness, hate and spiritual death. In soberness lets meditate on bible verses to help open our hearts and receive the love of Christ. 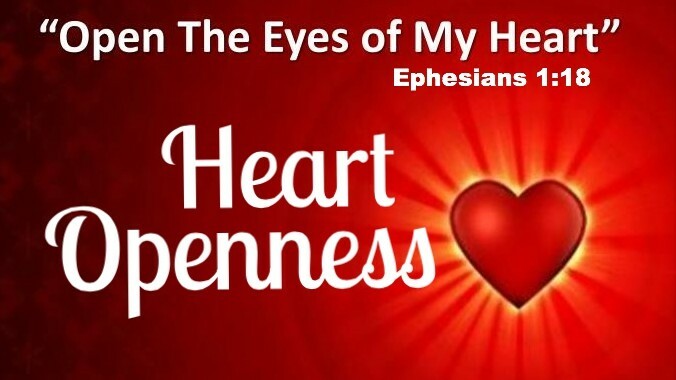 In that state of openness the spirit of God will perform a heart detox and reveal the spiritual functions of the heart such as seeing, rejoicing, right judgement, purity, life, power and more. Father, reveal the condition of my heart to me and help flush out all debris of the past, the sin that will make me stumble. Make my heart of stone a heart of flesh and fill me with your anointing that breaks every entangled chain of sin. Amen.